The successor to the highly successful F-3H Demon and fourth in a series of the McDonnell Corporation's jet fighters, the ungainly looking F-4 Phantom II is considered one of the greatest and most versatile jet fighters ever built. Conceived during peacetime, it served as an interceptor, strike and reconnaissance aircraft, and was the second most produced jet fighter after the North American F-86 Sabre. The Phantom II was one of the largest postwar programs with a total 5,195 aircraft constructed—5,057 built by the McDonnell Corporation and 138 under license, by Mitsubishi Aircraft in Japan.1 It was first fighter aircraft to fly simultaneously with the US Navy Blue Angels as well as the USAF Thunderbirds, and was the first US Navy fighter to be adopted by the USAF. By January 1962, it was flying with three branches of the military—the US Navy, USAF and USMC. The Phantom II was the first fighter aircraft to be designed with missiles only. Guns were added on later models. Before production began, extensive wind tunnel testing revealed stability problems above Mach 2 and numerous design changes would be made to become the now familiar F-4 Phantom. The wing was originally designed with a 45 degree sweepback with a constant anhedral, but it was found that a three degree dihedral was needed to improve stability.8 Rather than design a new wing requiring major modifications, outer wing panels were added with a twelve degree dihedral.9 The 12 degree panel corresponds to a 3 degree dihedral overall. This became one of the F-4 Phantom's most distinguishing features, which incorporated a dog-tooth leading edge and drooping ailerons or flaperon—flaperons move down only, not up. Ahead of each flaperon were spoilers, which aided in lateral control. The YF4H-1 was fitted with wing leading edge flaps which extended from the wingtip all the way inward to about one-quarter span. There were two segments with the division at the wing folding point. The leading edge flaps would extend on landing to provide additional lift at low speeds. The tailplane was a one-piece stabilator, requiring 23-1/2 degree anhedral that placed it away from wing downwash at high speeds,10 The J79-GE-8 was delayed coming into use and the J79-GE-3A turbojet with 9,600 lb. s.t. and 14,800 lb s.t. with afterburner (w/ab) was used in May 1958. The McDonnell Douglas F-4B Phantom was the first major production type. F-4Bs (F4H-1) were the first major production type with construction beginning in 1961 for 192 aircraft. 13 It was given the AN/APQ-72 air intercept radar and used AAA-4 infrared sensor beneath the nose radome. Missile combinations were six Ratheon Sparrow IIIs or four Sparrow IIIs with four GE/Philco sidewinder air-to-air missiles (AAM) mounted on two wing pylons and in four semi-recessed under fuselage bays. For the attack role, the F-4B could accommodate four wing and one fuselage attach points for a total of 16,000 lb of assorted bombs, including nuclear, conventional, napalm, missiles, rockets or three fuel tanks in place of weapons. It was given the J79-GE-8 turbojet engine with 10,900 lb s.t. (17,000 lb s.t. w/ab). In naval service, the F-4Bs were progressively upgraded as a result on combat experience in Vietnam. Chaff dispensers were added and Electronic Counter Measures (ECM) were improved with the addition of Radar Homing and Warning Systems (RHAWS) and Deception Systems (AN/ALQ-51 and AN/ALQ-100). The tailplane was retrofitted with slotted stabilizers as on the "J" models to reduce landing speeds. Production of the F-4B ended in 1967 with the completion of 649 aircraft.14 Forty-six unarmed photo-reconnaissance versions were designated as the RF-4B, of which all 46 were procured by the USMC. 228 F-4Bs were upgraded in 1972 and were designated as the F-4N. F-4Cs (F-110A) entered service with the 4453rd Combat Crew Training Wing at MacDill AFB in November 1963. First designated as the F-110A with the name Spectre, then as the F-4C, as the USAF was reluctant to acquire the Navy F-4 Phantom II. However, it quickly became the largest F-4 operator after it was pressured by Defense Secretary Robert S. McNamara to evaluate it against the Convair F-106A. McNamara wanted to reduce defense expenditures by standardizing Armed Forces equipment and in January 1962, the Department of Defense (DoD) instructed McDonnell to deliver two F4H-1s to Langley AFB in Virginia for evaluation. The aircraft were painted in TAC markings with F-110A painted very prominently on the nose. Compared to the F-106, it was capable of carrying heavier loads, had a 25% greater radar range, and required 1/3 less maintenance man-hours to flight-hours. It was considered much more versatile than the Republic F-105 Thunderchief and demonstrated better air superiority because of its lower wing loading and higher power ratings. For the reconnaissance role, it could be fitted for night photographic operations, unlike the RF-101 Voodoo. First designated as the F-110A then as the F-4C, the USAF was reluctant to acquire the Navy F-4 Phantom. However, it would become the largest F-4 operator. Externally the F-4C was very similar to F-4B, except the C model had wider tires requiring a bulging fairing for the tires. This feature was added to all models as weight increased. Internal differences were dual controls in the rear cockpit, the refueling receptacle was moved to the top of the fuselage and it had substantially different electronic equipment. Electronics included AN/APQ-100 radar, AN/APA-157 radar set group, AN/AJB-7 bomb control system, AN/ASN-48 Inertial Navigation System (INS) and an AN/ASN-46 navigation computer. The F-4C had no internal guns, but was basically armed with four AIM-7 Sparrow air-to-air missiles (AAM) recessed beneath the fuselage. External stores were conventional, chemical, laser, nuclear bombs or AAM, AGM, rocket launchers, SUU-16/A or SUU-23/A gun pods, or mines for a maximum load of 16,000 lb. The F-4C was powered by two J79-GE-15 turbojet engines with 10,900 lb s.t. (17,000 lb s.t. w/ab) with a built-in cartridge starting system. Delivery began in November 1963 and production ended in February 1967 with the completion of 583 aircraft. Forty of these aircraft were transferred to Spain and others became EF-4Cs. The F-4E was the major USAF variant with 959 aircraft produced for the USAF and 428 produced for export. Although the original Model 98B proposed four 20-mm cannons, a design change in 1954 called for a long-range high-altitude Mach 2 interceptor of which only missiles would be required.15 However, experience in Vietnam with air-to-air encounters showed that this arrangement was inadequate since the earlier Sparrow and Sidewinder missiles did not perform up to expectations. They frequently missed their targets and were subject to countermeasures. SUU-16 gun pods were installed on the F-4C but the extra drag degraded performance and took the place of ordinance or fuel pods. To correct this, an internal General Electric Vulcan (M61A) 20 mm, six-barrel, rotary-cannon with 639 rounds was installed on the F-4E. 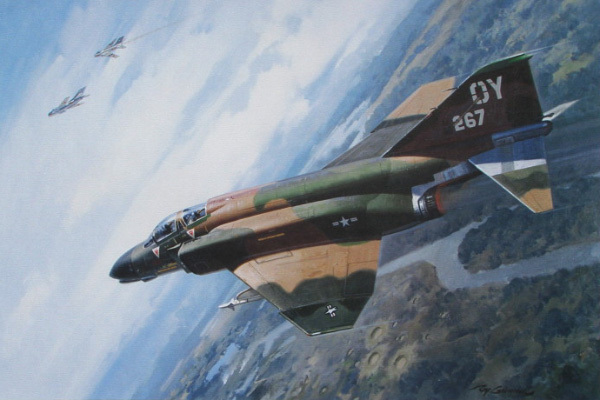 Due to limited space, a new nose configuration was adopted from the RF-4C reconnaissance version, housing an AN/APQ-120 radar set with a smaller 24.5" x 27.4" antenna and an external pod below the nose housed the cannon.16 Other modifications included a slotted stabilizer, the removal of the automatic wing folding mechanism, a ninety-five gallon fuel tank was installed in the aft fuselage to balance the cannon, and self-sealing fuel tanks replaced fuel bladders. A blast diffuser and derichment system was installed to prevent the ingestion of gas gun vapors which would cause the engine to flame-out. Late model F-4Es included a beefed-up wing center section to extend service life and leading edge slats to improve flight performance. Early F-4Es were later retrofitted with the leading edge flap systems. The McDonnell Douglas F-4E Phantom was the major USAF variant and had a an internal rotary-cannon. The basic armament still included four semi-recessed AIM-7 AAM and external stores of earlier variants but export version were delivered without the ability of arming and delivering nuclear weapons.17 As new electronics became available they were added during production or later retrofitted with AVQ-23A/B Pave Tack range finder, AN/AVQ-26 Pave Tack infrared/laser target designator and AN/ASX-1 target identification system. 180 F-4Es were later retrofitted with a Lear Siegler AN/ARN-101(V) to improve navigation and accuracy of weapons delivery. The F-4E was powered by two J79-GE-17 turbojet engines with 11,870 lb s.t. (17,900 lb s.t. w/ab) and later modifications included smokeless burner cans which reduced the black smoke trail which made the aircraft easier to spot from a distance. Export versions of the F-4E went to Israel, Turkey, Greece, Iran and Korea. 116 F-4Es were modified in 1975 and adapted as electronic warfare systems which were redesignated as the F-4G Wild Weasel. The F-4J superseded the F-4B and was the last version to be produced for both the US Navy and USMC. It was equipped with a ground attack AN/AJB-7 bombing system, increasing that capability substantially over the F-4B. Also installed was an AN/AWG-10 fire control system housed in an enlarged radome, an AN/APG-59 pulse-doppler radar to detect aircraft at low altitudes and an AN/ASW-25 one-way data link system for automatic carrier landings. Other changes included larger wheels and the stronger wing center section as on the USAF version, an additional fuel cell in the rear fuselage, and (VTAS) Visual Target Acquisition System helmet sight, which was also retrofitted on earlier models. The F-4J was powered by two J79-GE-10 turbojet engines with 11,870 lb s.t. (17,900 lb s.t. w/ab.) Armament included four semi-recessed AIM-7 AAM plus external stores of 16,000 lb of bombs, missiles or rockets. The F-4M was the RAF version of the Royal Navy F-4K, both of which were powered by the two Rolls-Royce RB.168-25R Spey turbofan engines with 12,250 lb s.t. (20,515 lb s.t. w/ab).18 Changes were made to the fuselage to adapt the new engine and the engine inlets were larger, but in spite of the increase in power, performance was degraded. The RAF version was equipped with an AN/AWG-12 fire control system and a Ferranti INS. Basic armament was four Sparrow AAM, but later replaced with British Aerospace Sky Flash missiles. The reconnaissance version carried a special pod that housed cameras, infrared sidescan and side-looking radar. 116 F-4Ms were produced between July 1968 and October 1969. The F-4 Phantom was first in many aerospace innovations. One system introduced in 1959 was the buddy tank inflight refueling system which was tested successfully at supersonic speeds and new weapons were tested such as the GE/Philco AAM-N-7 sidewinder missile. It was able to attain an initial climb of 35,000 ft/min and was able to carry an external bomb load of no less than 22,500 lb. It was truly a remarkable airplane. The F-4 Phantom would break fifteen aviation world records listed below. December 6, 1959. Absolute altitude record of 98,556 ft (30,040 m). September 5,1960. Attained and average speed of 1,958 mph over a triangular course for 15 min and 91 sec. 870 mph. 2,446 miles (3,936 km). August 28,1961. Low altitude record of 125 ft (38 m) at 902 mph (1,452 km) for 1.86 miles (3 km). December 5,1961. Sustained altitude record of 66,443 ft (20,252 m). February 21,1962. Time to height record. 9,843 (3,000 m) in 34.52 sec. February 21,1962. Time to height record. 19,685 (6,000 m) in 48.78 sec. March 1,1962. Time to height record. 29,528 (9,000 m) in 61.62 sec. March 1,1962. Time to height record. 39,370 (12,000 m) in 77.15 sec. March 1,1962. Time to height record. 49,213 (15,000 m) in 114.54 sec. March 31,1962. Time to height record. 65,617 (20,000 m) in 178.50 sec. April 3,1962. Time to height record. 82,021 (25,000 m) in 230.44 sec. April 4,1962. Time to height record. 98,425 (30,000 m) in 371.43 sec. April 4,1962. Absolute altitude record of 100,000 ft (30,480 m). Not officially recorded by the FIA. 1. Enzo Angelucci and Peter Bowers. Sparkford Nr: Hayes Publishing Group, 1987. 314. 2. Bill Yenne. McDonnell Douglas, A Tale of Two Giants. New York: Crescent Books, 1985. 214. 3. J.W.R. Taylor. Warplanes of the World. New York: Arco Publishing Company, 1966. 87. 4. Rene J. Francillon. McDonnell Douglas Since 1920, Volume II. Annapolis, Maryland: Naval Institute Press, 1990. 176. 5. William Green and Gerald Pollinger. The World's Fighting Planes. New York: Hanover House, 1959. 193. 6. Enzo Angelucci and Peter Bowers. 311. 7. Douglas J. Ingells. The McDonnell Douglas Story Fallbrook, Ca: Aero Publishers, Inc., 1979. 109. 8. Lloyd S. Jones. U.S. Fighters.Fallbrook, CA: Aero Publishers, Inc., 1975. 310. 9. Paul St. John Turner. Profiles in Aircraft, Volume 9, McDonnell Douglas F-4 Phantom. Garden City, New York: Doubleday & Company, Inc. 1971. 62. 13. Paul St. John Turner. 65. 15. Paul St. John Turner. 62. 18. Kenneth Munson. Fighters in Service, Attack and Training Aircraft since 1960.New York: The MacMillan Company, 1971. 134. 19. Paul St. John Turner. 64. William Green and Gordon Swanborough. The Complete Book of Fighters. New York: Smithmark, 1994. 369. ©Larry Dwyer. The Aviation History On-line Museum All rights reserved. Created March 10, 2008. Updated November 11, 2014.